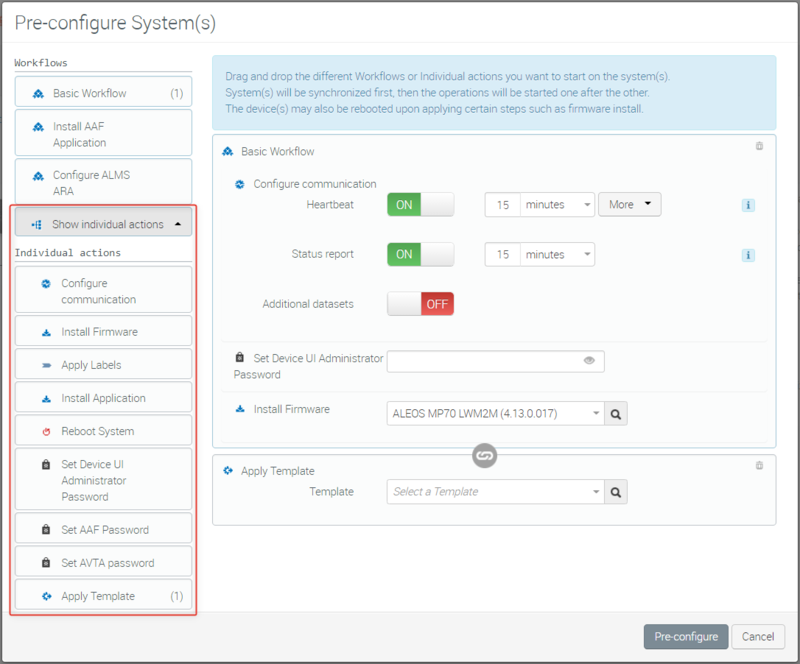 To simplify your deployment you can pre-designate the configuration you want AirVantage to apply when it connects the first time. 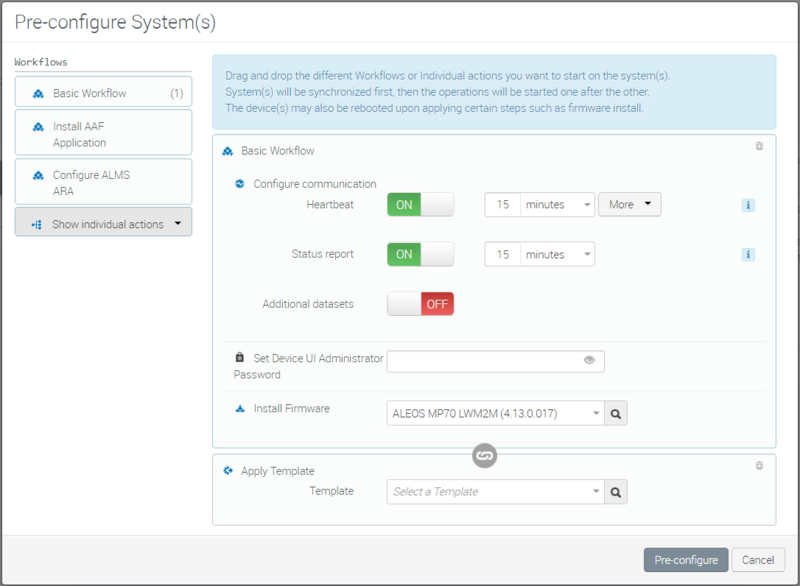 The Pre-configure System(s) window offers several pre-defined workflows for pre-configuration. The other pre-defined workflows are Install AAF Application and Configure ALMS ARA (available only in the ALMS ARA offer class on an MP70 device). Using one or more of the pre-defined workflows is recommended because they enforce an order of operations that is required for a successful deployment. If you create a custom workflow using individual actions (described below), you must ensure that the order of operations is correct. For example, ensure that the AAF password is set before installing an AAF application. Once the systems start communicating with AirVantage, the operations will be executed one after another, to end up with the desired configuration. Please note that this initial configuration will undertake one operation step only at each device communication interval. The overall configuration may take few device heartbeat periods. The device will reboot one or more times during this process. Heartbeat is the time interval that the device will communicate to AirVantage. All relevant jobs that are in queue in ALMS are triggered based on the heartbeat. This timer cannot be set to less than 15 minutes, unless your account is in the ALMS ARA offer class. Note that the heartbeat will consume around 1.4 Kb of data. Clicking More expands the window to show two additional timers that relate to the status icon that appears on the Monitor > Systems page. You can enter a timeout value to change the green icon to amber and from amber to red. Status report is the time interval for collecting the group of status data from the device for display in AirVantage. For information on status report data and airtime usage, see Default Status Report Parameters and associated data consumption . Additional datasets is the time interval for collecting a user-defined set of data from the device for display in AirVantage. You need to create a Dataset data set in AirVantage in advance to configure this option. To create a dataset, go to the Configure > Datasets page. Click on the + to begin the process. Easily set a unique password for the device at deployment. Sierra Wireless recommends changing the unique default passwords on all devices. When using MSCI, the password is required to allow ALMS to remotely change the ACEmanager password. Enter the ACEmanager password used to login to this device directly. Once registered, it’s recommended to update your passwords. It is also used to enable the ALEOS server-initiated communication option, and as the M3DA password for ALEOS Application Framework (AAF) applications. 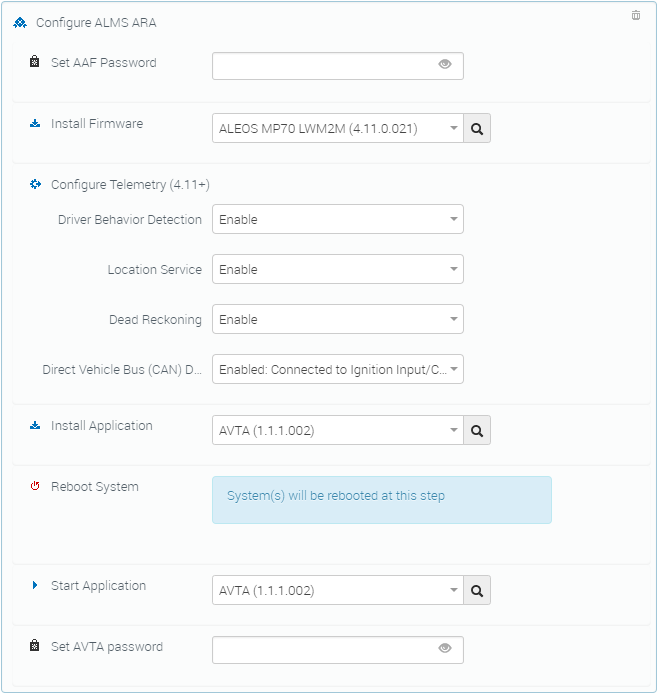 This option lets you apply a firmware update to the systems that you are adding to AirVantage. Prior to selecting this option ensure that you are selecting a valid upgrade version. 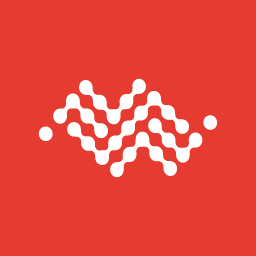 Some older versions of AirLink ALEOS firmware have dependencies that may require an incremental update. In that case apply the valid version. You will be able to apply the latest version once the systems are registered and communicating with AirVantage. You need to create an ALEOS configuration template in AirVantage to apply that template when the new system registers. To create a template, go to the Configure > Templates page. Click the + to begin the process. You have the option to create a template from scratch (select Brand New) or from an existing device that you have already communicating with AVMS (select From System). You can add the Install AAF Application workflow to the Basic workflow if you wish to install an AAF application such as AVTA. Set an AAF password. The AAF password can be 4 to 100 characters long and can contain a mixture of letters, numbers, and/or special characters. The password is case sensitive. Select the desired AAF application from the list or by searching (click the search icon). To install additional AAF applications, add “Install Application” as an individual action (see Creating a Custom Workflow below). This workflow is available only to the ALMS Advanced Reporting and Analytics (ARA) offer class, and for telemetry-capable systems. For more information about prerequisites for ALMS ARA, see Reporting. Install the latest firmware for your device. For an AirLink MP70, ensure that ALEOS 4.9.0 or later is installed. Configure Telemetry for your system by ensuring that Driver Behavior Detection, Location Service, Direct Vehicle Bus Data Collection and Dead Reckoning are enabled. Note that the settings for Configuring Telemetry differ slightly depending on the ALEOS version. However, the final functionality is the same. Install the latest version of the AirLink Vehicle Telemetry Application (AVTA). Select the Start Application. This is the application that starts running after the Install Application process is complete. When configuring ALMS ARA, select the same version of AVTA for both Install Application and Start Application. You can customize pre-configuration by adding actions to an existing Workflow or by creating your own workflow from the individual actions available in the left column of the Pre-configure Systems window. Click Show individual actions to display the list of available actions, and then drag and drop actions into the main window to create a workflow. To remove an action, click its “bin” icon ( ) or drag the action back into the left-hand column.